The basement social room welcomes members and friends of First Presbyterian Church 1793 for the free community holiday meal called the “Feeding of the 500” in Washington, PA.
What began as a small outreach that provided a warm meal to a hundred people in the Washington, PA, area two days before Thanksgiving has blossomed into a community-wide event that now feeds more than five times as many people and includes – from the volunteers to those being served – all different walks of life. The meal is available for two hours in the evening, allowing for two or three shifts to feed 125 people each time. Another 250 meals are available at the takeout window. This year, First Church served nearly 540 meals and had the largest sit-down crowd Jan can remember. 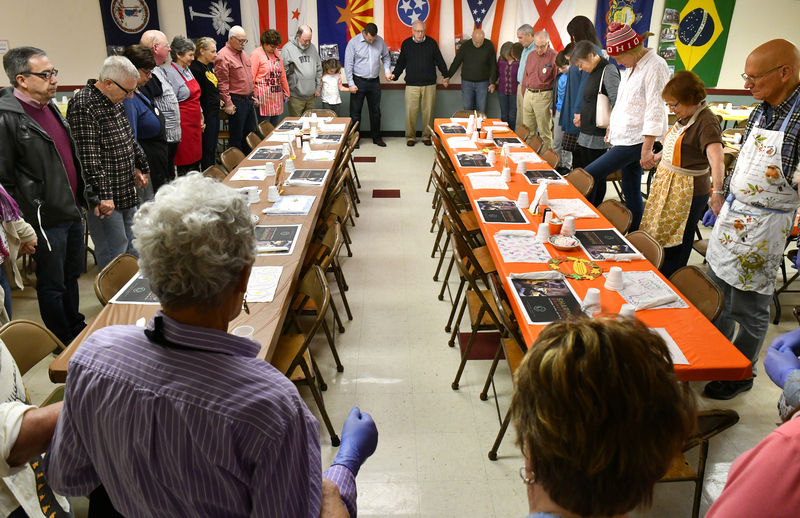 Volunteers gather to give thanks and ask a blessing before the meal is served at the Feeding of the 500 at First Presbyterian Church 1793 of Washington, PA.
Former First Church pastor Burt Campbell brought the idea of serving a community meal to the congregation in the 1980s. Jan, who isn’t sure why Tuesday was picked as the day to serve the meal, remembers the early beginnings of the outreach. As attendance grew, it became necessary to have the turkeys prepared at the church. In recent years, 22 turkeys have been cooked for the Feeding of the 500 meal, roasting that occurs in two shifts on Monday. On the day of the meal, the rest of the dishes are cooked. 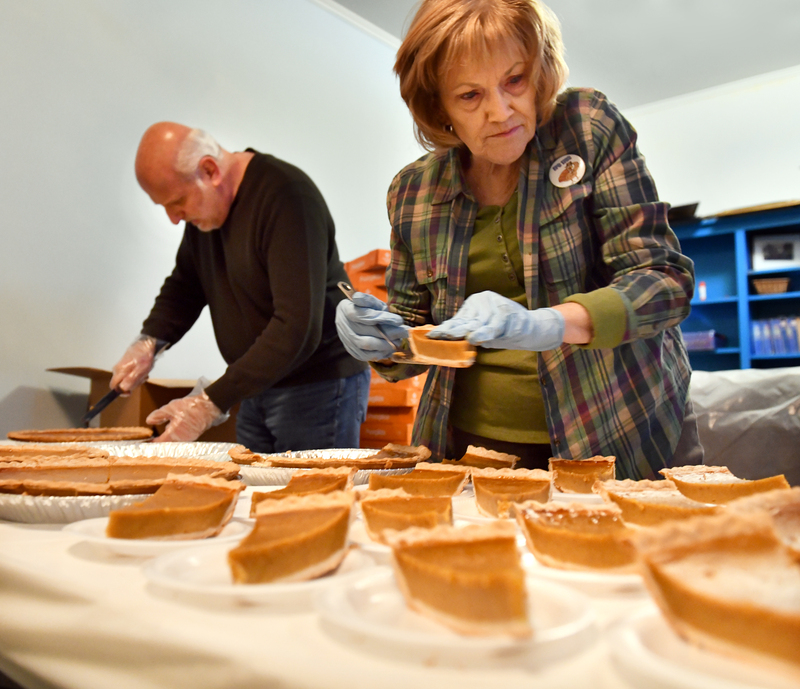 There is one caveat: the pumpkin pies are all purchased from a local store after it became too difficult to bake them in time for the meal. The Washington-area food bank helps promote the meal by displaying and handing out flyers, and agencies like the blind and deaf associations as well as Resurrection Power, which provides housing for people who are in drug and alcohol rehabilitation, also make the outreach known to those with whom they serve. “People in some of the low-income housing areas will come,” Jan continued. “People from other churches come. We have attorneys, politicians, doctors. We have just about everybody. It’s really a nice mix of people. It’s very heart-warming to see a doctor sitting beside a homeless person just sharing a meal. Fifty pumpkin pies are sliced and placed on plates, ready for whipped topping. The volunteers not only come from First Church and its neighbors but also places like Washington & Jefferson College, which is represented by both students and professors, and organizations like the Boy Scouts that use the opportunity as a service project. 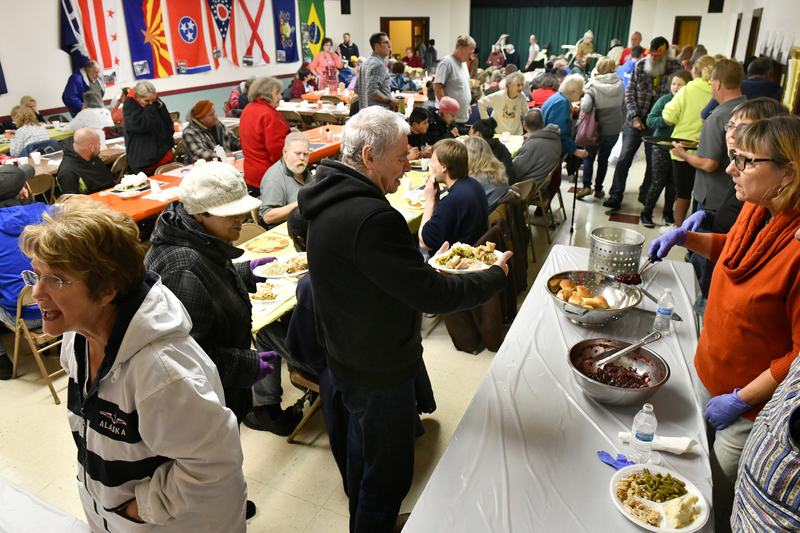 The annual meal also serves a secondary purpose: it allows the community to better understand the purpose of First Church. And on the Tuesday before Thanksgiving, that’s exactly what First Presbytery Church 1793 does.